The village of Zia is the highest of the five villages that make up the municipality of Asfendiou on the island of Kos . It was a traditional village of 200 inhabitants, surrounded by woods, fresh springs and walnut orchard and other fruit trees. The village is unfortunately increasingly plagued by tourism, all tourism agencies on the island with their program the famous "sunset Zia," followed by "Greek nights" in poor taverns. The summit of Mount Dikeos was a place of worship dedicated to Zeus (Dia). Zia Ζία written in Greek. Zia village is about 15 km west of Kos town and not far from Pyli . Turn right out of Asfendiou . Zia’s situation, 350 m altitude on the slopes of Mont Dikeos allows a wide view of a large part of the island of Kos , the nearby islands of Kos and north on the west coast of Anatolia. On the north coast of the island you can see the old salt marsh of Alikes near the village of Tigkaki . 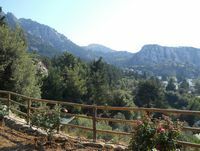 Zia is located at the foot of the mountain and near the famous Kefalovrissi source, including water Zia crosses from south to north, watering gardens and supplying water mills in the region. On the north side of the mountain, south of Zia, there are three churches: the further south, the church Saint-Georges Theriotis the church Sainte-Marie Kiparissiotisas, and near the source Kefalovrissi the church of the Presentation of the Virgin Mary (Kouvoukliani), a small church nave. Tourist pressure is very strong Zia traditional houses have been transformed into tourist shops, selling, pell-mell, kitsch souvenirs, carpets, ceramics or spices. The main square is surrounded by taverns. 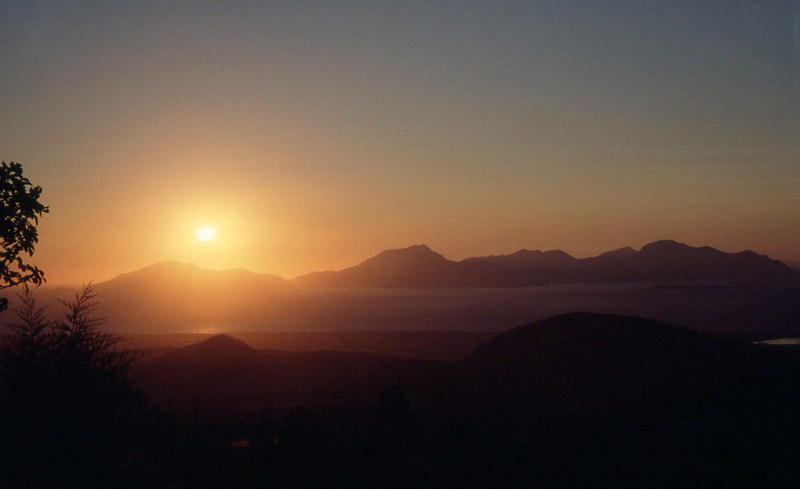 It is famous sunsets that attract up to six tourist buses per evening: they are indeed spectacular. Zia is the starting point to climb Mount Dikeos or Dikaios (Όρος Δίκαιος) which is the highest point of the island of Kos , at 846 m altitude. Since Zia, there should be one to two hours to reach the summit without major problems if there is no wind (500 m elevation), the view from the top is worth it. 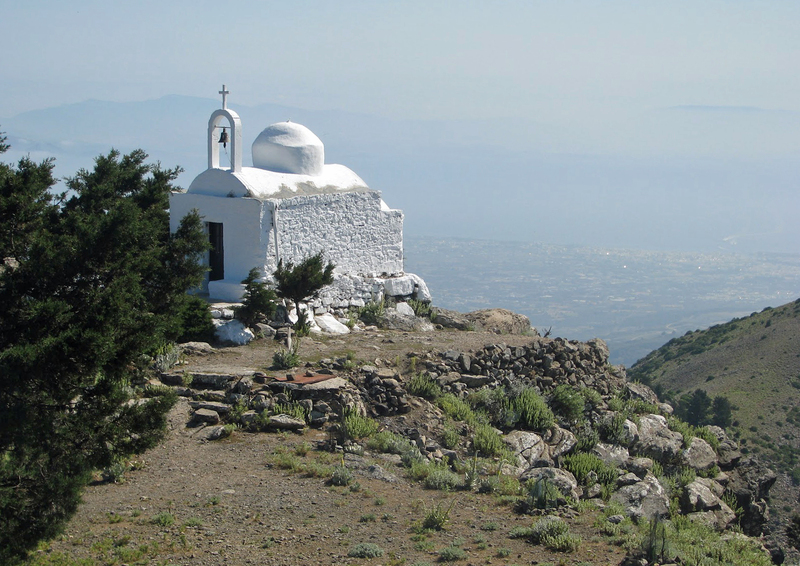 The summit of Mount Dikeos is the monastery of Christ the Savior, also known as Christ the righteous, founded in the eleventh century by the monk Arsenios Skinouris Kos (in 1079). The name Dikeos will also say "right", "right." The full name of the mountain is Dikaios Christos, Christ the righteous. The mountain was named in antiquity Oromedon (Ωρομεδών) Kos ancient sculptors came to seek his old stone marble quarries. The restaurant Kefalovrissi (Κεφαλόβρυση) is 1.5 km from the center of Zia, isolated at the top of the village, we reached the foot of a staircase. Hours: rather unpredictable (April to October). Inquire by phone. Price: 10 to 15 €. Magnificent rooftop terrace at the foot of Mount Dikeos, overlooking the whole island. Kefalovrissi the dishes of the day as the traditional pansetta or bakaliaros and good mezedhes.